It’s the kind of story that drives liberals crazy. A good guy with a gun stops two alleged robbers from getting stolen guns out on the streets. 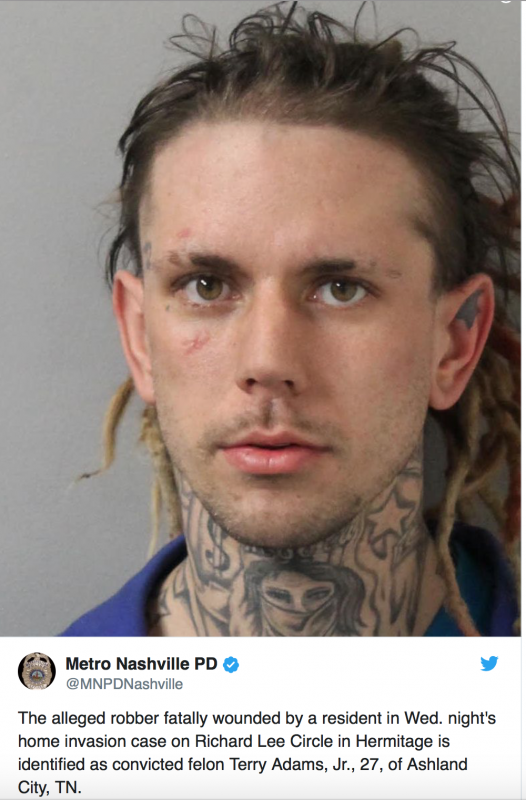 An armed resident stopped two criminals from stealing guns in Tennessee this week, after he shot one of them. Metro Police say the man who was shot, Terry Adams, Jr., was a suspect in a burglary that happened at the same house back in February. Officers say the homeowner, who News 2 is not identifying, came home Wednesday night to find his back door open. Once inside, police say the homeowner was hit in the head with something so forcefully, it fractured his skull. Metro Police say while the homeowner was away, two men, including Adams, forced their way inside and hit the homeowner's wife in the face. Police say the suspects forced the homeowner to open his gun safe and say they stole 3 long guns and a pistol. While that was happening, police say the homeowner's wife ran to a neighbor's house for help. The homeowner was not aware where his wife was so when the suspects left, police say he grabbed a pistol and went outside. While looking for his wife, police say the homeowner came across the suspects and there was a fight. Police say the homeowner shot Adams, and say when that happened, the other suspect dropped the guns and took off. Adams was taken to the hospital where he died. So a suspected repeat offender joins another man, attacks a couple, allegedly takes several guns from a locked safe and is only stopped after the armed homeowner shoots and kills. This story will surely be picked up by all of the liberal media and made national, right?